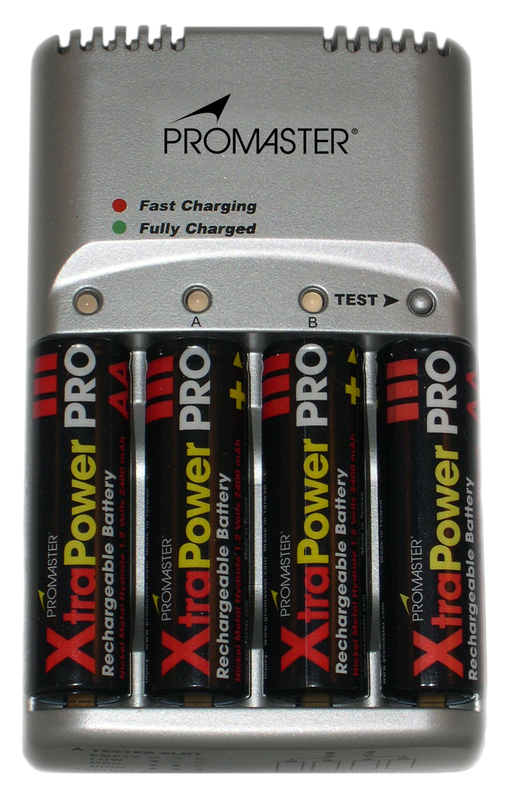 Fairfield, CT (August 1, 2005) – Photographic Research Organization, Inc. (PRO) announced the introduction of the PROMASTER XtraPower PRO 59-Minute Charger, the first fast “smart” NiMH charger with a built-in battery tester. This ultra compact charger will charge most NiMH AA/AAA batteries in 59 minutes or less. Compact, lightweight and durable, the XtraPower PRO 59-Minute Charger delivers the maximum charge to the battery’s full capacity ~ from empty to fully charged ~ in 59 minutes or less. The new charging technology employed in the PROMASTER 59 minute charger matches the charging rate to the needs of the individual batteries and keeps batteries cool during charging without the need for bulky cooling fans, extending the life and the performance of the batteries. The XtraPower PRO 59-Minute Charger continuously measures and optimizes the energy acceptance level, applying a rapid charge initially, then reducing to a trickle charge when peak voltage is reached. XtraPower PRO 59-Minute Charger will be available in October, through PRO member retail stores nationally. Photographic Research Organization, Inc. (PRO), a national retail cooperative founded in 1958, is owned and managed by some of America’s most innovative independent specialty photo retailers. Known as “imaging experts” in the local markets they serve, member stores offer a full line of traditional and digital photographic cameras, lenses and related equipment and accessories. Additionally, PRO member stores offer on-site film processing and digital imaging services as well as a complete range of supplies designed to enhance the picture-taking experience. Market driven and quality conscious, PRO creates and distributes premium quality lenses, digital camera memory, batteries, accessories and filters, as well as digital and conventional electronic flashes, through member retail stores under the company’s signature PROMASTER brand. For more information on PROMASTER products and dealer locations visit www.promaster.com.